Mumbai: F.N. Souza’s Sewing Machine hangs in the hallway outside Tina Ambani’s office; along with Sudhir Patwardhan, Jayshree Burman and Bikash Bhattacharjee. Reliance Centre, this commercial establishment with its sheer glass walls and muted corporate tones, is crammed with art. “Some people think ‘oh, she’s just a rich housewife buying art’," Ambani says, embarrassed, adding that she knows people who seek the former actress in her, are disappointed. “The artist in me moved on to other arts." The Harmony Art Foundation’s annual show, curated by Gayatri Sinha this year and titled Fabular Bodies: New Narratives in the Art of the Miniature, opened on Friday at the Coomaraswamy Hall of the Chhatrapati Shivaji Maharaj Vastu Sangrahalaya (formerly the Prince of Wales Museum), Mumbai. “Being an artist, you always have a close affinity to creativity. When I started the show, I wanted to do something to promote textiles. Bombay 15 years ago lacked an awareness of art. There was not so much disposable income. Artists were struggling. As an artist myself, I always wanted to provide a platform for them. It was a coming together of all these," she explains. Why was there no Harmony Art Show last year (2010)? I ask myself that all the time. Last year, Reliance was awarded the running of the Delhi Metro, and I was keen a budget be set aside for art. The Harmony Art Foundation had the vision of taking it to the next level; to install art for public viewing. The process of checking sites, transporting works, fittings, was quite time consuming. The pieces are quite large you see, 20ft by 60ft; and because these things are restricted by a budget, it’s not like we could acquire works for any amount. I really appreciate the artists contributing works at reasonable rates for this project. In retrospect, maybe I should have made an extra effort to make both happen. Is enough being done to bring art into the public domain? This year’s show seems smaller and you’ve skipped the artist showcase too. Why? Post 26/11, we decided it was appropriate to be muted. I saw the attack on the Taj as an attack on our culture and heritage. Hence, that year, we did the miniature. To me it was a way of embracing our origins. Six hundred years ago, when Europe was doing large canvases, the Persians were bringing miniatures to India and we were expressing ourselves in fine detail. I’ve always been attracted to that. Since we didn’t have a show in 2010, this year we extended the metaphor and moved to contemporarise it. We thought let’s see how people react. We wanted artists evolved enough to take it forward. The Rietberg Museum in Switzerland is also currently showcasing a miniature art show, curated by Padmabhushan Dr Goswamy, our guest of honour. Have to ask, there’s nothing miniature about Reliance, is there? All your canvases here are larger than life! Well, a miniature may be small in size, but they have so much more detail, so much more story, so much more history and depth. In such a small space they say so much. So... (waves hands in air and shrugs). it’s not the size that matters. You have Waswo Waswo, Orijit Sen and Pooja Iranna next to a Nilima Sheikh, Mithu Sen; aren’t they a varied mix? How do they string together? I’m very excited by the mix this year. Anant Joshi has been a part of the Harmony show for years now. Iranna crosses mediums; painting, video installations, sculpture—there is so much available out there to an artist today. Honestly, five years ago, video as an art form didn’t excite me. Today, you see how art has changed and grown. I just loved Orijit Sen! To be able to take a comic strip to an art form in the miniature; stunning work; his detailing and his precision, it’s like a print. Anything is art if you have the eye for it and if it has that level of aesthetic and detail. These artists come together in the format of the miniature, but yes their expression is varied. How much do you seek control over the show? Do you seek curatorial control? I don’t have the knowledge to be a curator. It’s a very heavy-duty term and a very responsible position to hold. It involves academic expertise. 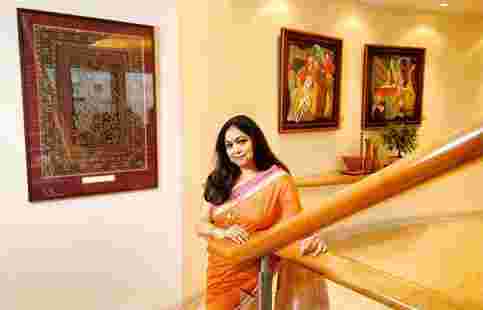 My current curator Gayatri Sinha is someone I had not worked with before, so I didn’t want to cramp her style. I took care to step back and respect her for what she does. I ensured the show was in line with Harmony’s template, but you have to give her the space and freedom to express herself. I like to work with people who bring in newness to art. I’m learning all the time. Is that what you also try to translate the show into? Divesting art of its snootiness as a domain of the elite? Exactly. Art is something that can bring a very sensitive, humane touch into your life. We invite schools to bring kids to the show. We have an art historian at hand to explain it to them. I also try to ensure that the art we show is saleable. When I started the Harmony show, a lot of works wouldn’t sell. All the works are specially commissioned and I would feel so bad that four-five works sold and these didn’t, that I would buy them myself. That’s how I began to build my collection. The point of inviting an artist to the show is also to generate the revenue that allows him to go onto his next work. In those days, paints were imported as were brushes and canvases. The point is not merely to showcase the artist, but to support him comprehensively. Tell me about your collaborations with museums? We invite artists from all over the world for residencies. I am also on the board of the Peabody Essex Museum in Salem, Boston, that has a deep association with India. They also have the Chester Herwitz collection with over 150 works of our top artists. During the spice trade, Salem being a port, sailors would travel to Calcutta and bring back art with them over centuries, which the museum has acquired. You witness how the West is taking forward their art. I hope to translate what I learn from there in India. You do have plans to start your own museum? I do hope to. It is my passion and if I don’t achieve it in my lifetime, I hope my sons take it forward. Any museum I create will not merely be art; it will include everything that can be seen as art; to me vintage textile is art, a comb from ancient India is art, dance is art. I would like to create a space where art is comprehensive and available.